It usually surprises people to realize how easily, and quickly, regular, traditional lock hardware can be picked. There’s tons of educational resources out there for burglars to teach themselves how to break into homes. By investing in a high security Mul-T-Lock door cylinder, you can maximize the security of your home, protecting your home from the range of entry techniques. It’s a simple operation by a Locksmith’s away from ensuring that your home or business is fully protected. The Hercular Deadbolt is a high security steel and brass deadbolt system. It has a ANSI Grade 1 Security Certification – and features internal protection from all manners of lock picking tools including drills, wrenches, ice picks, hammers, bumping, and prying attacks. 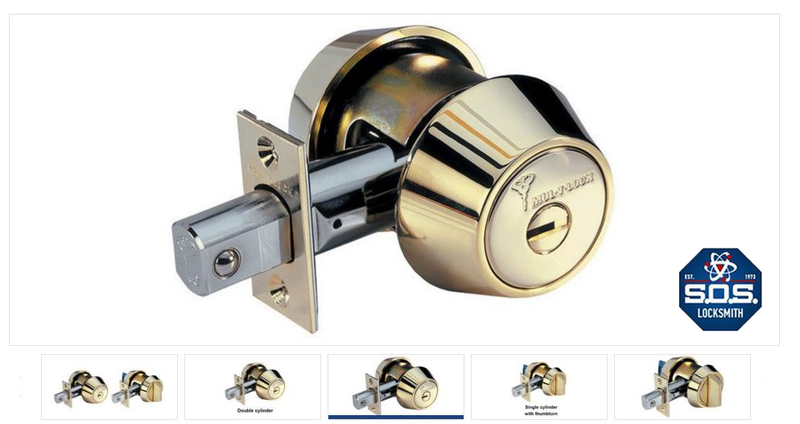 This lock has matched or exceeded the most rigorous of industry standard tests. What makes this lock so unique, is it’s patented inner key slot structure. It’s impossible to copy it’s keys from a photo, as many untrustworthy key companies do with standard keys. The Mul-T-Lock Hercular Deadbolt combines the strength of a double sided locking deadbolt with the ergonomic usability of a thumbturn unlocking latch. Since the Hercular Deadbolt has a customizable internal structure, there are countless options for how you can arrange your key situation. You can choose to have a key that works on some, but not all doors – or have a single master key to open every high security lock in your home or business, including doors, cabinets, padlocks, or other security checkpoints. With its truly unique design the MUL-T-LOCK deadbolt is truly spectacular. The Hercular deadbolt is reinforced in just about every way possible. From a UL437 Listed Cylinder, to strong latch, to Bolt Bearing Mechanism, the Hercular Deadbolt will stop almost any attempt at forced entry. Strength usually does not mix with Flexibility. Not in the case of the Hercular, since it is the only Grade 1 Deadlock with an adjustable back-set. 90˚ key rotation throws the bolt 1″ towards the frame, interlocking two hardened ball bearings with the strike to increase jimmying resistance. Mul-T-Lock’s unique, high-precision pin tumbler system.